No, we're not talking about sprinkling your greens with a scoop of protein powder or chasing those string beans with a double-strength protein shake. Believe it or not, there are vegetables that can be part of a protein-fueled dish on their own—and not just because they're paired with a medium-rare steak or rotisserie chicken. We've put together a list of the eight vegetables that provide the most protein bang for your buck. With more protein than any other bean variety, cooked soybeans have about 28 grams per cup, roughly the amount of protein that can be found in 150 grams of chicken. More important, soybeans are one of only two complete plant proteins, the other one being quinoa. A serving of soybeans also contains 17 grams of carbs and 15 grams of fats, 58 percent of which are essential fatty acids. The insoluble fiber in these beans promotes digestive health, while the unsaturated fat promotes cardiovascular health. These little protein-filled pods have likely made their way onto your plate at some time or another, or have at least been served alongside an order of sushi at your favorite Japanese restaurant. You might have dismissed their protein-rich capacity initially, but don't let the small size fool you—these pods pack a mighty punch. Edamame—immature soybeans that are boiled or steamed in the pod—contains 22 grams of protein per cup. Pair that with your main protein dish, and you'll be well on your way to the recommended 30 grams of protein per meal. From string beans to chickpeas, beans are an excellent source of plant-based protein. When it comes to legumes, lentils are among the winners. They contain about 18 grams of protein per cup when cooked, and at 230 calories per serving, they're great for anyone watching their calorie intake. Lentils are also a great source of dietary fiber and contain a high amount of the micronutrients folate, thiamin, phosphorus, and iron. Toss them into a cold salad, use them in a soup, or even mold them into a protein-packed meat-free patty. Looking for fat-free protein gains? You might want to check out the green veggie that looks like a miniature tree. Often thought of as simply a side dish to accompany beef or chicken, one cup of chopped broccoli has 2.6 grams of protein all on its own. And unlike your standard animal-based protein, a cup of these green florets also packs over 100 percent of your daily need for vitamins C and K.
Broccoli is also a good source of folate, another important vitamin that has been shown to decrease the risk of certain types of cancer. Peas contain just under 9 grams of protein per cup. They're also a good source of vitamin A, C, thiamin, phosphorous, and iron. 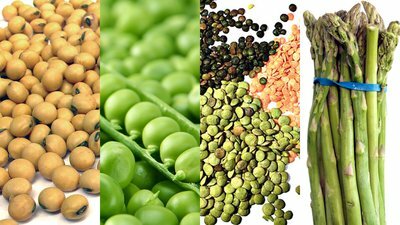 Additionally, the generous amounts of B vitamins and folate found in peas can help reduce your risk for heart disease. Each serving also contains 5.5 grams of fiber. Toss these little guys into a salad, serve them alongside a serving of chicken breast, or add them to a hearty pasta primavera on a high-carb day. If you've ever prepped for a physique contest, you're likely no stranger to the power of asparagus. In fact, those thin, green spears are likely a common presence on your dinner plate. Aside from being a diuretic—hello, slimmer self, bye-bye, water retention—asparagus is considered protein-rich in the vegetable world. Just 100 grams of the green stuff contains 2.4 grams of protein. Asparagus is also the number one plant source of vitamin K, as well as a good source of potassium and antioxidants. Once you've ground that gourd into a delicious pie, you might find yourself wondering what to do with the seeds. Roasting them provides a good snack alternative to chips, but did you know that just one ounce provides more than 5 grams of protein, more than half of the protein found in an egg? In addition to being a plant-based protein bomb, diets rich in pumpkin seeds have been associated with lower levels of gastric, breast, lung, and colorectal cancer. Pumpkin seeds are also rich in antioxidants, which can help reduce oxidative stress and inflammation. Facing a sleepless night? The L-tryptophan in pumpkin seeds has been suggested to encourage a good night's sleep. Whether incorporated as part of a veggie stir fry, a topping on a turkey-and-cheese sandwich, or as an added crunch to a salad dish, mung bean sprouts are a great choice for some additional plant-based protein. Once cup of cooked beans contains 2.5 grams of protein, and is packed with other nutrients such as lecithin, which may lower cholesterol, and zinc, a mineral that plays an important role in optimizing physical performance.